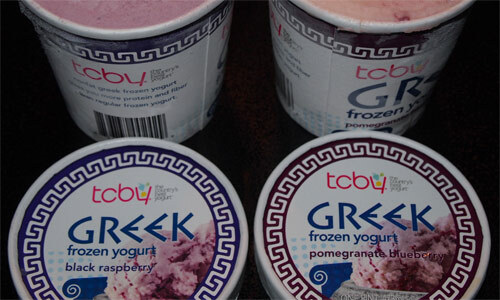 [New for 2013, discontinued] When TCBY debuted their new frozen yogurt products last year, how long did you really think it would be before they debuted some kind of greek line up as well? Well, I've been walking by them on store shelves for a few months now, so let's take a peak at what I finally purchased. I debated it for a few minutes, but in the end I decided to go with my beloved black raspberry and then chased that with blueberry & pomegranate (I know, you probably expected me to go strawberry). Side by each... I know which one looks tastier... actually, that's not true. The swirl of the bluepom is pretty cool looking while swirls in raspberry flavors tend to scare me off a little.... ahh, we're still going with raspberry first. YAY! No Tang! There's still that milky note of a greek yogurt, but it's not offensive. Flavor is fairly mild. It's raspberry, but it's a milky raspberry. There I go saying milky again, but that's what I taste. Wait, skim milk, that's the description I'm looking for. Hey, I can only complain so much with no fat and 6 grams of protein right? 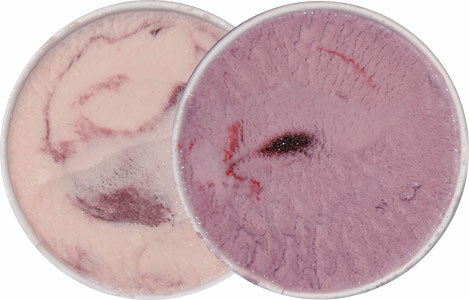 The swirl is fine, but it doesn't have much of an impact. Ahh, this stuff ain't bad, and at least it ain't chalky! Alright, quick water rinse and time for pomegranate blueberry. Subtle aroma of blueberries. Weird, seems icier than the other flavor. Is the base suppose to be pom and the swirl the blueberry? Boy that's a long ingredient list..... makes me miss Blue Bunny's all natural froyo... anyway, yeah, it looks like pomegranate flavored base and a blueberry variegate (swirl). Why doesn't anyone ever do like pom base with like strawberry chunks? Why is it always blueberry? Is it the whole anti-oxidant thing? Yeah, I'm bored, but this probably doesn't surprise you. So the moral is that these ain't bad, but they don't have any particular unique qualities to keep my attention. They are healthy enough and they aren't tangy, so there's no reason to not work something like this into your frozen rotation if you want. I tried these a few times, but no official second scoop on this one. In TCBY's defense, my wife happily finished these off for me (she's a big froyo fan! ).